Chapter 13 bankruptcy, also known as “reorganization bankruptcy,” is a process that allows you to repay your creditors over a period of three to five years. Unlike Chapter 7 bankruptcy, which requires you to sell off certain assets, Chapter 13 allows you to keep your property and repay your debts through a court-approved repayment plan. One of the biggest advantages of filing for Chapter 13 is that it can help you save your home from foreclosure. As long as you stay current on your mortgage payments and pay back all of your mortgage arrears by the end of the repayment period, you will be able to keep your home. Even if you are already in foreclosure when you file, the automatic stay will stop the lender from foreclosing until your bankruptcy has been completed. Unlike Chapter 7 bankruptcy, you will not be required to pass the means test in order to file for Chapter 13. However, that is not to say that Chapter 13 bankruptcy is right for everyone. Since you will be required to pay back some or all of your debt, you will need to prove to the court that you can afford your monthly payment obligations. 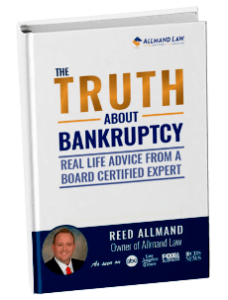 If you are interested in learning more about Chapter 13 bankruptcy, we encourage you to discuss your options with a Fort Worth Chapter 13 attorney at Allmand Law Firm, PLLC. As the largest bankruptcy filing firm in Texas, we have already helped thousands of debtors regain control of their finances. Our lead attorney is also a board certified bankruptcy expert, so you can trust that your future will be in capable hands.